The Grabbit (ウサムシ?, lit. : "Rabbit Bug") is a small grasshopper-like enemy found in Hey! Pikmin. It is green with large red eyes, so it can easily be mistaken as a scarpanid, but it is actually a jellyper. It has a lighter green head and an overall ovular shape. It sports tiny bug-like wings that it uses to jump very high, with the help of its legs. 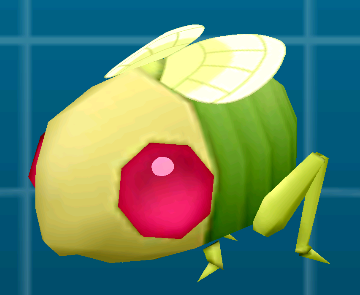 This is also its method of killing Pikmin, by landing on and crushing its target. It is about the same size as Captain Olimar, although a bit shorter, and only needs one Pikmin throw to kill. Grabbits hop around an area, only turning around when they face an obstacle. Any Pikmin that are underneath them when they land will be killed. Pikmin can, however, walk right past them without being killed. A Grabbit can be defeated by just throwing a Pikmin at one. It is usually safer to wait until they land and stand still, preferably under the arc of its jump, since at that point they are harmless. Throwing right before it hits the ground, as long as you predict its landing spot, will hopefully kill it before it jumps again. It will also take a moment to turn around, so then is a good time to strike. A Grabbit preparing to jump. This page was last edited on April 17, 2019, at 11:16.